One problem that got around me was – when I plug in my headphone on the Mac jack, there’s voice only on one side (I couldn’t tell which is right or left since the two sides on my headphone are exactly the same). I have never met such issue when I upgraded my Mac to El Capitan (the OS X version before Sierra), therefore I have no idea what caused it. 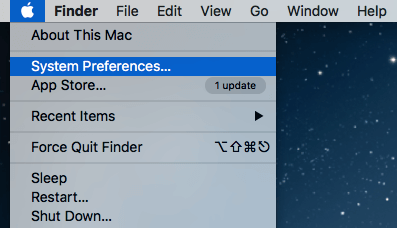 Step 2: in the Preferences pane, click Sound. Step 3: in the new window, under “Output” tab (select this one if you are not here). See “Balance”? Move the pointer to the middle, and you should be good to go. P.S. In my case, it pointed to “right”, that’s why there was only sound coming from one side on my headphone. Hope Apple would take care of this issue when releasing the next macOS version, which’s coming soon. Thanks for reading. Hope you find this tip useful! I just got the same problem. Find some explanation below. .. Since you haven’t received a response I’ll throw out a couple of ideas. I’ve heard the same type of thing when headphones have gone bad and grounded a hot wire on one side, obviously not the problem with your setup. It’s possible the software involved is sensing the headphone impedance and changing output to something other than stereo. -If you’re listening using iTunes, under Preferences/Playback, make sure “Sound Enhancer” is unchecked. -In the Utilities folder, open Audio/MIDI setup, check the Configure Speakers button and make sure the multichannel setup is set to stereo, and set to left-1, right-2, do this with the phones plugged in. WARNING- avoid clicking on the “left front/right front” buttons unless the sound is turned way down, you will get a blast of white noise. The jack for the external speaker and the jack for the headphones are identical, correct?